Something is not right. Something seems to be sucking the hope out of the world. Hector Graham sees it in the gradual death of his hometown, Seabreeze, where he was born and grew up, where he married and raised a son. He sees it in the arrival at night of strange children who go door to door, demanding to be let inside. For some, the children bear gifts . . . but they come with a terrible price. Jeff Duggins sees it in the sudden disappearance of an online friend known as Lizard Man. Jeff and his friend Darryl take a road trip to Sacramento to check up on Lizard Man and make sure he's okay. They are concerned because he's been making some strange claims about a pet iguana that has grown to enormous size and started to talk . . . and say some scary things. Ray Garton brings his unique brand of fear to these two novelettes of modern dread in the digital age . . . a time when nothing is as it seems and everyone has a theory about what's really going on. The music has begun. It's time to dance the . . . PARANOIA TANGO. When you purchase the Lettered edition direct from SST you will receive an exclusive SST bookmark SIGNED by Ray Garton! "The pair of terrific novelettes that comprise Paranoia Tango are vintage Ray Garton! Razor-sharp, thought-provoking, creepy as hell, and populated with three-dimensional characters readers will instantly root for! But don't get your hopes up too high for these folks—Garton isn't playing nice in Paranoia Tango, a double-barreled nightmare for this new world we all live in!" 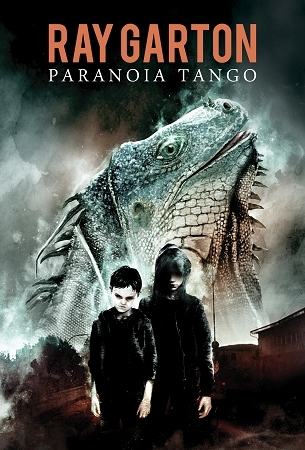 "The Paranoia Tango is a pair of dark, twisted tales that drag you into the twisted depths of human susceptibility, the nagging lizard-brain that tells us that everything isn't what it seems, and what lies behind it all is much, much worse. Ray Garton's gripping, visceral stories will tie you in knots and leave you yearning for another dance."